Over the last few weeks I must of worked with at least 10-15 sales clients representing different companies in different fields. Let me say, I have a very high esteem for those who have chosen the field of selling. It’s a field where you can earn huge amounts of monies if you are prepared for it. More importantly, it’s a field where you can earn huge amounts of money if you are willing to work for it. Nothing is ever simply handed to you. 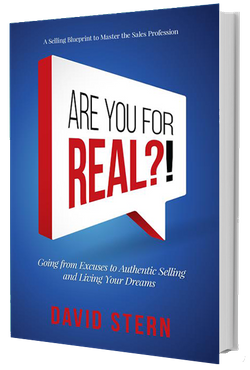 Unfortunately, many sales people like the idea that they can earn lots of money but don’t understand the inner workings of sales, and what it takes to get to be successful, consistently. What I am talking about is “L-earning” the business of sales. If you take the L away from learning you wind up with earning, but you won’t get to earning anything if you don’t apply the L first, and that’s the tougher part of learning before you earn. 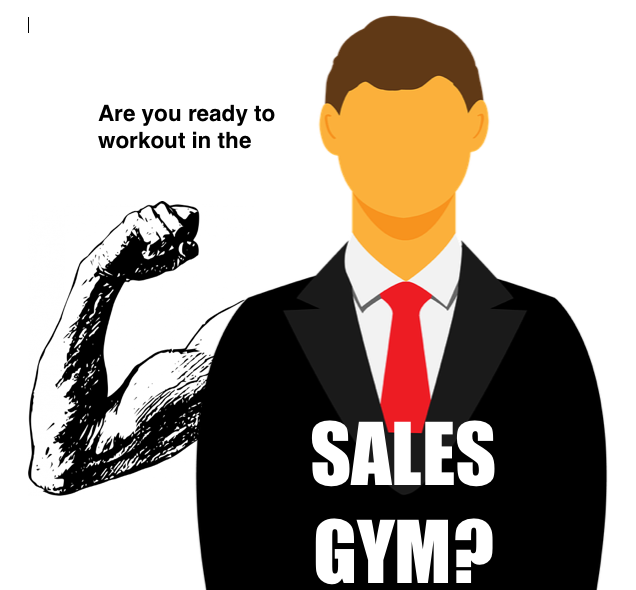 That’s how I came to develop the concept of the Sales Gym Workout. Think about it, have you ever seen anyone go into a gym flabby obese with no muscle strength and come out minutes later built rock solid? Of course not. That’s never how it happens. You have to commit to going as many times a week as necessary, work out hard and also diet. It’s the same in sales, you have to understand each muscle and learn how and why it works and practice practice and more practice. Also, many sales people don’t vet the company they will be representing, they go to work there because of the promise of big dollars. What about sales, product, or personal growth training? Many sales people don’t ask any questions. Just like if you were to join a weight loss program that promises that you can lose 40 pounds while eating chocolate cake and french fries. It’s a myth. Goals, goals, goals… these are critical to begin with, no matter what you are doing. In business and sales, like in getting fit, it begins with goals. In particular written goals that make your journey even more real. (Read more on SMART GOALS for success). Once you have a set of goals, then map out those smaller steps that you will need to take to reach them, down to the smallest thing. For example, if you’re hoping to add one new client every month, examine what things you will need to do more of — or less of — to reach that goal. That could include scheduling time for phone calls, buying an app on your phone that will help you with sales territory mapping and time management. Enlist a coach like you would a personal trainer to help you become accountable and focused on your goals. You may even find that person will suggest other goals, or the best ways to get there sooner. A good coach also helps you work smarter to rid yourself of wasted time and energy, which can help you also capture revenue that might have been lost as well. Make sure the person you're sharing your time with is also qualified, and doesn’t promise you the moon. The same goes for opportunities that you might encounter, which promise untold wealth with little proof to back it up. It was all fluff. He couldn’t give me the answers, so the end result was me telling him if he really had a REAL job opportunity with the potential of earning those numbers, he would have had a line from Brooklyn to Connecticut with applicants. I moved on, and so should you when you hear offers that promise all reward without any effort. You likely have areas that you excel at and others that you need further work on, and like being in a gym, you need to make sure every part is getting the attention it deserves to achieve the best and most balanced results. Great on time management, but not so much on interpersonal skills? How about keeping a positive attitude? Everyone is unique in their strengths and weaknesses and examining ALL of the necessary skills with an honest and critical eye will help you develop overall, and it will likely also be reflected in your personal life. It’s time to recognize and throw out bad habits. They are the greasy potato chips to success. When you start to change those habits, it’s at first difficult; you really have to THINK about it and be conscious of your behavior. Like learning the correct form in exercising or lifting weights, you might be a bit slow at first, but once you’ve gotten into the good habit, it becomes natural. The key here is keeping consistent. You can’t pick and choose which days to work on your form. Once you decide to make a change, it needs to be a permanent commitment to change, for the better. After you become comfortable in your new routine, it’s time to change it. Comfort can be a dangerous thing, and like exercise, if you don’t change or increase your challenges, your results will begin to flatten out. The best exercise routines aren’t routines at all. Your body is pretty smart, and begins to become more efficient if you’re doing the same exercise day in and day out. You “plateau” and perhaps stop losing weight. So you need to wake it up and do something different to keep challenging and expanding your ability to maintain and improve your optimum fitness. Our brains can do the same thing. Have you ever taken the same route to a place multiple times in a week? At times you arrive at your destination and think, “I don’t even remember the trip here.” Some people call it mindfulness, or intentionality. I call it paying attention. We start off by being focused on improving, then become accustomed to the goal once we’ve reached it, then we forget to pay attention to how we’re doing, and that’s when things can get sloppy. There are always new things to learn, and new skills to develop. Don’t simply quit when you reach the first goal. Set another. This perhaps shouldn’t be the last thing on the list. Personal development is the leafy greens and high fiber of any success program. What you offer first and foremost is yourself. You are the product, the commodity, that is being sold, either to a prospective customer, an employer, or anyone you come into contact with in business. Your coach should help you focus on what’s inside before making the more outward changes. Fears, perceptions, attitudes and general life experience can stand as obstacles to our success, and no college degree will ever fix that. Taking a hard look at what makes you tick, and learning how to overcome your fears is a long but worthwhile process. Weight loss depends predominantly on diet, with exercise coming in a distant second. Did you know that? It’s the same for personal development. EVERYthing begins with personal development and no lasting success can be had without it. So, lace up your tennis shoes, grab a water bottle and begin. Because once you make the honest decision to get started, you’re halfway there.